The liberal media outrage mob erupted this past weekend and demanded accountability from Tucker Carlson for a radio interview he gave to a shock jock 10 years ago. Democrat smear website, Media Matters For America, was behind this latest attack on FOX News host Tucker Carlson. Tucker Carlson posted a response to the radio interview on Sunday. He refused to apologize to the mob. On Monday night Tucker Carlson opened his show with a lecture on the liberal outrage mob. 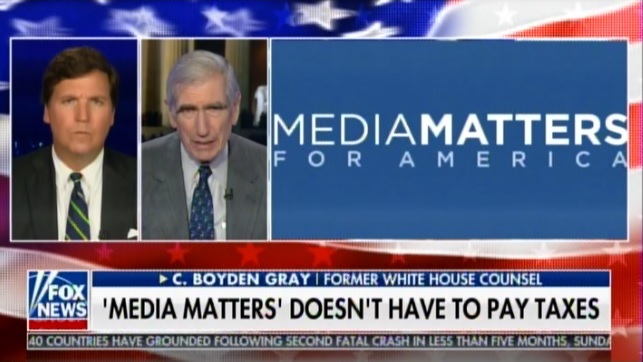 Tucker brought on former White House Counsel C. Boyden Gray to discuss the scandalous hate website Media Matters for America.